Long before Trayvon Martin’s death sparked a national debate and demonstrations, the shooting of another teenager, James H. Ito, raised questions involving race, violence, and justice—except Ito’s case took place 70 years ago. Ito was one of 10,000 imprisoned in Manzanar, one of 10 War Relocation Authority camps built to confine all persons of Japanese ancestry on the West Coast, U.S. citizens and immigrants, after the outbreak of World War II. On Dec. 6, 1942, the 17-year-old Pasadena student was resting in his barracks when he heard commotion. He stepped outside and found himself in the middle of a confrontation between about 2,000 protestors and military police. Demonstrators reportedly taunted the MPs and threw stones. The confrontation became deadly when two of the MPs fired their weapons into the unarmed crowd. Ito was killed almost instantly. Another man, James Kanagawa, 21, died five days later. Ten others were wounded, including an MP hit by a ricocheting bullet. A month later, a military hearing absolved the two MPs of any wrongdoing, ruling they acted in self-defense. Janice Mizuhara, Ito’s niece, first learned of the shooting when as a child she noticed that her grandmother (Toyo Ito) always wore “that worn, torn vest with the hole in the back.” The vest was the one James was wearing the night he was killed. Recently, Mizuhara began a journey to set the record straight and remove the stigma from her family’s history. 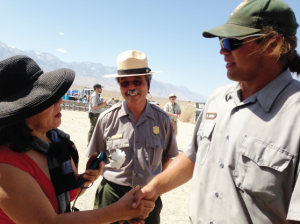 She reached out to community organizations including the Gardena Valley Japanese Cultural Institute, Manzanar Committee, and Friends of Manzanar, who pledged to help raise awareness of the wartime injustice. Manzanar, opened in September 1942, had been operational for less than three months when tension began to grow amid rumors that camp officials were stealing sugar and meat and that some of the Nisei active in the Japanese American Citizens League were acting as FBI informants. On Dec. 5, 1942, Fred Tayama had just returned from the JACL national convention in Salt Lake City when he was attacked by six masked assailants. Authorities arrested Harry Ueno, who had been organizing a kitchen workers’ union and was the first to accuse officials of the thefts. Camp project director Ralph P. Merritt, on the job for less than two weeks, feared that the camp police would not be able to control the growing tensions between the pro-JACL and pro-Ueno factions. He called in the military, and 135 soldiers were deployed. By the next evening, Dec. 6, protesters had assembled in front of the Manzanar police station, demanding Ueno’s release. From inside, Ueno could hear and see the commotion. Accounts differ as to what happened next or what the MPs may have heard, but suddenly the soldiers opened fire. Dr. Paul Takagi, UC Berkeley professor emeritus of criminology and education, became emotional as he addressed attendees at the 2007 Manzanar Pilgrimage, recounting his experience as a hospital orderly. He remembered sitting beside the other mortally wounded young man, Kanagawa. The camp hospital “had no life-support system, no hydration system, no oxygen. Kanagawa was lying on his right…with wounds in his back, stomach and pancreas. The hospital was eerily quiet, and sometime during the night (Kanagawa) said, ‘I don’t want to die, I don’t want to die,’” Takagi said. 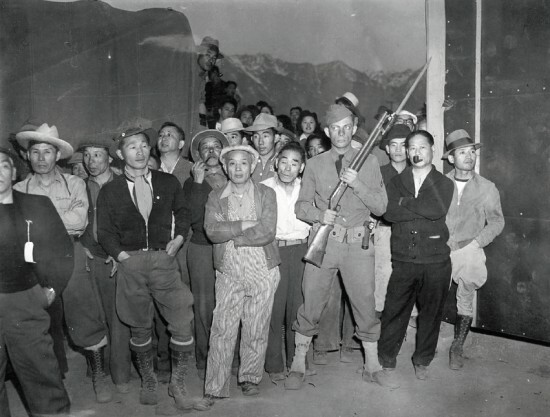 “About a week after the shooting incident, a Military Board of Inquiry composed of officers from Sixth Army Headquarters in San Francisco arrived at Manzanar…to determine whether or not the military policemen who fired into the crowd and killed or wounded ‘evacuees’ should be held responsible for the shootings. “Dr. James Goto personally examined each of the victims and took note of the entry wounds. During the inquest, the authorities ordered Dr. Goto to testify that all of the bullets had entered the victims’ bodies from the front. Such testimony would support the assertion that the crowd was charging toward the soldiers and that the soldiers had fired in self-defense. Before the war, Goto spent six years as house physician with the Los Angeles County Hospital. 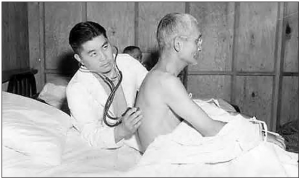 He was relieved of his post as Manzanar chief of medical services. “A white doctor took his place,” Oda added. 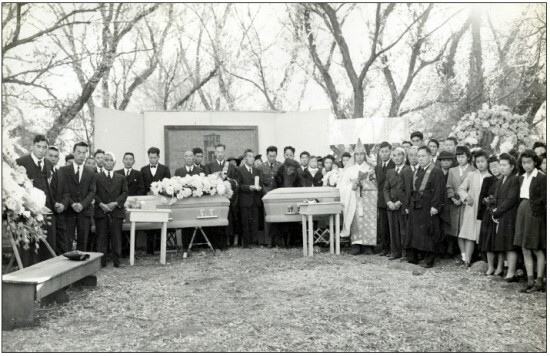 Two days after the violence, all Japanese American incarcerees who reported for work wore black armbands — a sign of mourning for those who were shot. After Kanagawa died on Dec. 11, Merritt faced a new dilemma. The families of the two deceased boys wanted to hold funerals. Newly instituted restrictions banned large gatherings. The prisoners requested special permission to conduct memorial services in the camp’s outdoor theater. They also asked that restrictions on mass meeting be lifted so that an expected 1,000 mourners could attend. In contrast to the dozens of armed MPs involved in the melee two weeks earlier, only one soldier was present at the Buddhist funeral service, Ito’s older brother who was serving in the U.S. Army even though his family had been imprisoned by the government. On Dec. 21, 1942, despite the restrictions, the entire camp population said a two-minute prayer and observed a time of silence at 1 p.m. — the time of the funeral. On Jan. 3, 1943, the Ninth Service Command convened a Board of Officers to investigate the Dec. 6 incident. The body determined that the deadly shots were fired by Pvt. Tobe Moore and Pvt. Roman Cherubini. Moore fired three shots with a shotgun, and Cherubini fired 14-15 shots with a Thompson sub-machine gun. A third soldier fired at a driverless jeep rolling toward the police station. Each of the men also testified that they had fired their weapons because they believed they were in “personal danger.” On Jan. 4, the board issued a statement of findings, exonerating the military police of any wrongdoing or violation of orders. The MPs hadn’t begun shooting until after the second round of tear gas. Somewhere in the Mizuhara home, James Ito’s vest and jacket are neatly tucked away. For now, that’s where they will stay, bearing silent witness to an injustice seven decades old.